Info "Play with dragons, get burned." Dragon Duel is a microgame that is downloadable content for WarioWare: D.I.Y. & WarioWare: D.I.Y. Showcase. This microgame was released on April 29, 2009 in Japan, March 29, 2010 in North America, and May 7, 2010 in Europe. The object of the game is to slay the dragon. 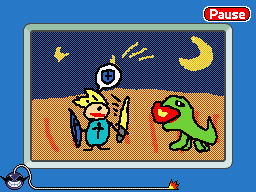 The player controls a little knight that will slowly move across the stage and towards the dragon. Eventually, the dragon will spit a fireball towards the knight. The player will need to tap the screen to put the knight's shield up. Once the fireball is disposed of, the player will need to tap the screen again to make the knight move again. When the knight comes in contact with the dragon, it will be slayed, and the game is won. However, if the knight is hit with a fireball while his shield is down, or if time runs out and the dragon isn't slayed, the game ends in a loss. This page was last edited on October 8, 2018, at 23:34.